The “highest” swing is set on a 700ft (210 meters) high viewing platform on the tower in Harbin city, Heilongjiang Province. Participants sit on the steel seat and swing out over the city, beyond the edge of the platform, according to Harbin Daily. 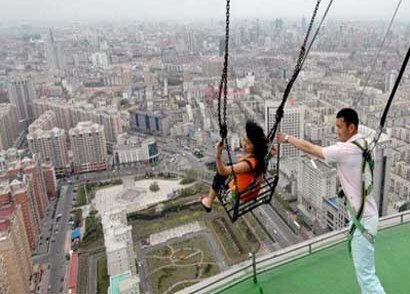 Luckily, this world’s highest swing is located in China, my friends have no chance to push me to go on it. hahahaha ….. This entry was posted on Saturday, May 12th, 2007 at 10:27 am	and is filed under Addicting Games, Interesting Stuff. You can leave a response, or trackback from your own site.